According to court documents obtained by TMZ, the mother of the son of Buffalo Bills running back LeSean McCoy alleges the NFL player was abusive to the child, now 6. She also claims McCoy used their son as a pawn in the wake of allegations that McCoy had been involved in the beating and robbery of his ex-girlfriend. Jay Ajayi is done for the year, giving the Eagles a big hole at running back. On the team as of Tuesday are Darren Sproles (who hasn't played since Week 1), Corey Clement (who has missed time as well), Wendell Smallwood and Josh Adams. Is the short week good or bad for struggling Eagles? "Jay is a big part of what we've done," Eagles offensive coordinator Mike Groh said Tuesday. "It's an injury that will impact us here until we get the guys back out there. Wendell, he's done a really nice job in the playing time he's gotten thus far in the season. Really pleased with his production; he’s done a nice job. Corey is progressing with his injury. We’re happy with the guys we got. We think we still have talented players to be able to be really good at the running back position." The Eagles opened up some cap space when they restructured Fletcher Cox' contract, which immediately begged the question: are they making space to acquire Le'Veon Bell from the Steelers? No concrete news has broken since the Eagles restructured the Cox deal but the Steelers, to whom Bell says he will report sometime after their Week 7 bye, may have some motivation to move him before the trade deadline passes in Week 8. Their 'fill in' running back James Conner is third in the entire AFC in yards from scrimmage with 581 through five games. McCoy left the Eagles in very interesting circumstances — via a shocking trade from Chip Kelly amid allegations of racism — and not much has changed as far as dramatics go for the Birds' all-time leading rusher. 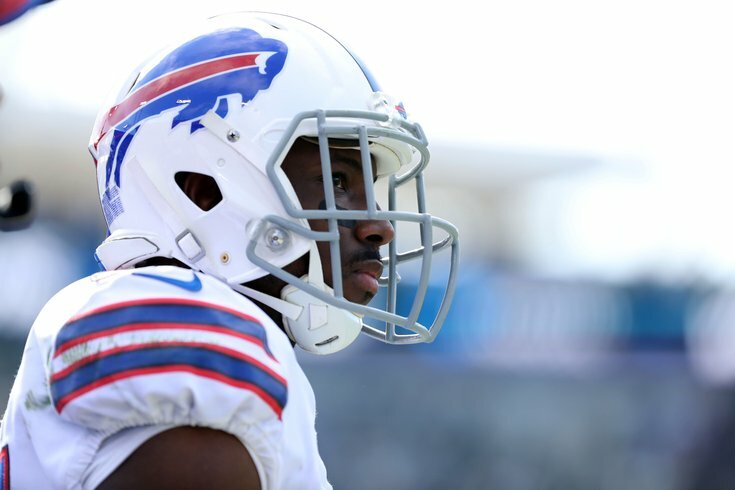 McCoy has had injury woes that have kept him off the field six times in his four seasons in Buffalo, but more importantly has been accused of several things from bar brawls to assault to child abuse. The Eagles, reportedly are still interested. There is a divisive split between those who think it's good idea, and those who do not want to part with a high draft pick (though John Clayton said it would take only a fourth or fifth rounder) for a 30-something running back. The pool of potential free agent RBs got slightly smaller Tuesday when the Jaguars signed Jamaal Charles with Leonard Fournette still injured. Others the Eagles could target or at least work out include Mike Gillislee, C.J. Anderson, Orleans Darkwa and Eddie Lacy. There are also a few lower profile trade candidates out there, like Ameer Abdullah or C. J. Prosise.
.@JohnClaytonNFL mentions Seattle RB C. J. Prosise as someone the #Eagles may be interested in for cheap. On the roster right now are four running backs but two of them have been hurt and have missed playing time, so it is likely at the very least a free agent will be added.